12noon – 1pm – Portland Sculpture & Quarry Trust – Sculpture interpretation walks and drawing sessions at Antony Gormley’s life size figure ‘Still Falling’ incised into the rock strata (whittled) falling through 250 million years of time. 1 – 2pm Explore mythical potential of caves & quarries with sound artists in Quarrymen’s shelter at Lano’s Bridge followed by projections at the Drill Hall. 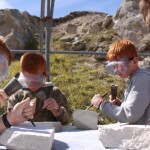 2 – 4pm – Memory Stones Stone Carving Workshop in open air workshop. 4 – 5pm – ten to fifteen minute encounters with architect Nicholas Hawksmoor ( assistant to Christopher Wren) in Tout Quarry ( at Drill Hall if rain) – who is arriving from the Painted Hall at Greenwich to select Portland Stone for the Greenwich Hospital for Seamen and 6 other London Churches. 5 – 6pm – Food and Refreshments – ‘Portland Fresh’ – reasonably priced Salads and Quiche, Smoothies, Tea & Coffee. 6pm – 7.30pm ‘Portland Stories’ – Absolute Theatre present excerpts from the project with sound and video recordings of peoples experiences and the ‘Roy Dog’ performance by students from IPACA. Portland Stories is an ongoing project based at the Drill Hall so if you have any stories or a story to tell, Simon and Peter will be on hand to record. Portland Sculpture & Quarry Trust – Living Archive 7.30pm to 8.00pm. Contact – Portland Sculpture & Quarry Trust at the Drill Hall Gallery for further details.